If you’re unsure whether the Stamps.com postage solutions and products are suited for your needs, you can sign up for a free Stamps.com trial account. The trial period lasts 4 weeks. During this period, you will have access to all the Stamps.com postage stamps, products, and services, just as you would with a paid account. To start using the company’s postage services, you must first create an account. In order to create an account on Stamps.com, click the red “Get Started” button on the main page of their website. There, you will have to fill in your email address, user ID (the name you will use to login to your Stamps.com trial account), and a password. 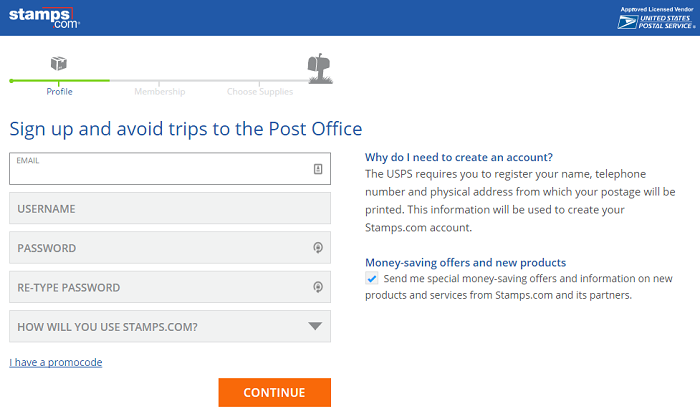 You must also select how you’re going to use your Stamps.com account. Companies and small businesses have three options: sending letters, sending packages, or sending both. There is also an option for home offices and individual use. You will also have to choose two security questions and their answers. These questions will be used to verify your identity when you log into your Stamps.com account. When you create your Stamps.com account, you will have access to all the services Stamps.com has to offer. In addition to these services, you will also receive $5 worth of free postage you can use as you like. You will also get the Stamps.com Supplies Kit for free. The value of the supplies kit is $5 and includes free address and postage labels and a user’s guide. On top of all this, Stamps.com will give you a 5-pound digital scale. You can use the digital scale to weigh mail and small packages, so you can calculate postage rates at home. The scale is valued at $50 and it’s yours to keep. Even if you decide not to upgrade your Stamps.com trial account, you won’t have to pay for it. When you upgrade your account, you will receive an additional $40 worth of postage in coupons. You can redeem the coupons after your trial period expires if you decide to upgrade your Stamps.com account. This Stamps.com bonus free postage will be spread out over 4 months, $10 worth of coupons per month. Upgrading your free account is easy. You simply have to pay $15.99 for the first month of use for a Pro account (one user) or $24.99 for Premier accounts (multiple users). The subsequent fee to maintain your Stamps.com account will cost the same. There are no other taxes or fees. The combined value of the Stamps.com sign up special offers and coupons is $100. If you’re not satisfied with their first special offer, there’s an alternative. When you sign up, you can opt for $50 Off Coupons instead. You will receive two $50 coupons you can redeem for a discount on selected Stamps.com products. One discount applies to the 35 lb. digital scale with the full price of $99.95. With the $50 coupon, you can get it for half that price. The other coupon can be used to get $50 off a thermal printer. Prices for thermal printers range between $80 and $320. If you opt for this special offer, apart from the $50 Stamps.com coupons you will also receive the Stamps.com Supplies Kit. To benefit from either of these two promotions, all you have to do is go to the Stamps.com Promo Codes page. You’ll see each offer described in detail on the page. You can click on the red “Redeem Now” button underneath the offer you’re interested in. This will send you to the sign-up form. Click the field next to “Have a promo code?” and the promo code of the Stamps.com offer will automatically fill in. Alternatively, you can go to the signup page yourself, and type in the code of the Stamps.com offer you are interested in. Bear in mind that the Stamps.com coupon offers and promotions will change from time to time. Sign up for their newsletter, or simply visit the aforementioned Stamps.com Promo Codes section to see the current coupons and offers. If you want to find out more about the products and services offered by Stamps.com, we recommend reading our Stamps.com review.